Concerns surrounding harmful side effects and medication interactions associated with prescription medications has led to increasing support of the use of OTC medications and nonpharmacological multimodal therapies to treat chronic musculoskeletal pain. Musculoskeletal pain is a common occurrence affecting many older adults. It is estimated that one in four older adults will suffer chronic nonmalignant musculoskeletal pain. With the increase in the geriatric population (35 million people who are aged 65 and older), the number of individuals suffering from musculoskeletal pain has grown exponentially.1 In light of this trend, it is extremely important to have a pain management strategy that helps to decrease patients' suffering and disability. The treatment options for elderly individuals can pose challenges, including concomitant medical conditions leading to drug-disease contraindications, polypharmacy with drug-drug interactions, and medical compliance with tolerance issues. 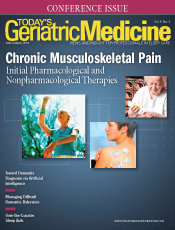 Moreover, elderly individuals are high-risk candidates for surgical interventions.2 This article highlights common musculoskeletal pain conditions in the elderly and offers providers insight into the management of these conditions, utilizing nonpharmacological and over-the-counter (OTC) treatment options. From 2010 through 2012, one-half (49.7%) of adults aged 65 and older reported physician-diagnosed arthritis, and it is estimated that by 2030, 67 million adult Americans could be diagnosed with the condition. According to recent statistics from the Centers for Disease Control and Prevention, nearly one in two people may develop symptomatic knee osteoarthritis by the age of 85, and one in four people may develop painful hip arthritis. In 2011, there were more than 750,000 knee and 500,000 hip replacement procedures related to arthritis alone.4-7 Chronic pain associated with arthritis can impose serious activity limitations on individuals. People can suffer significant declines in walking, climbing, bending, and social interactions; this leads to an overall decrease in quality of life. Some potential causes of back pain in the elderly include muscle strain/sprain, compression deformities related to falls and osteoporosis, degenerative facet joint conditions, lumbar spondylosis, lumbar spinal stenosis, and lumbar disc degenerative changes. Chronic low back pain can significantly interfere with an individual's gait, mobility, and posture, and increase the risk of falls. The chronic pain associated with musculoskeletal conditions can pose serious activity, physical, and emotional limitations. Chronic musculoskeletal pain can lead to a vicious cycle of disuse and inactivity.2 People can suffer significant decline in function, decreased ambulation, fear of movement, functional dependence, disability, impaired posture, and muscle atrophy. Elderly individuals may also suffer sleep disturbances, behavioral problems, social isolation, depression, and anxiety related to their chronic musculoskeletal pain. It is extremely important to employ treatment programs that can overcome the cycle of disuse and inactivity. Moreover, it is important to focus on improvement in quality of life through effective and comprehensive treatment strategies. The main purpose of treatment programs is to decrease pain and improve function. Multidisciplinary programs incorporate several modes of therapy such as pharmacologic and nonpharmacologic options. These options have demonstrated the greatest benefit and highest efficacy in managing chronic musculoskeletal pain. An individualized program that identifies current medical conditions, medications, home life, and goals is cardinal for geriatric patients. 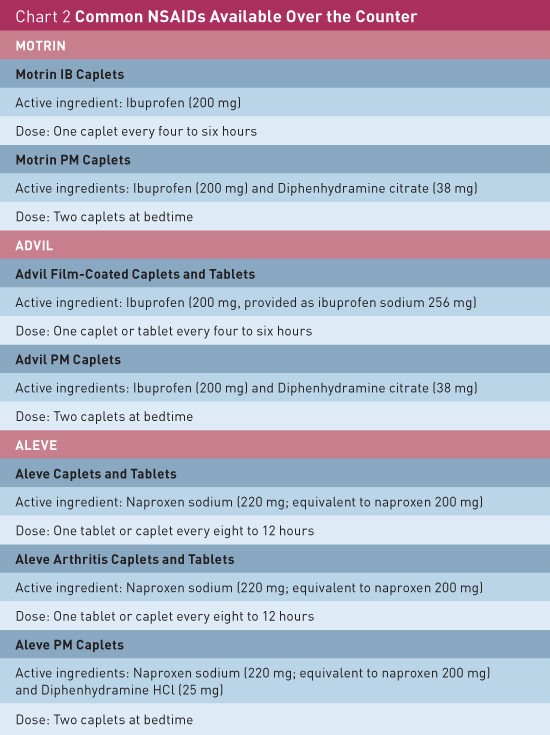 The adult daily dose and frequency for generic acetaminophen is 325 mg to 650 mg every four hours or 650 mg to 1 g every six hours as needed for pain. The half-life of generic acetaminophen is roughly two hours; the maximum daily recommended patient-directed use, according to the FDA, is <3 g per day and, under physician-instructed use, <4 g per day. 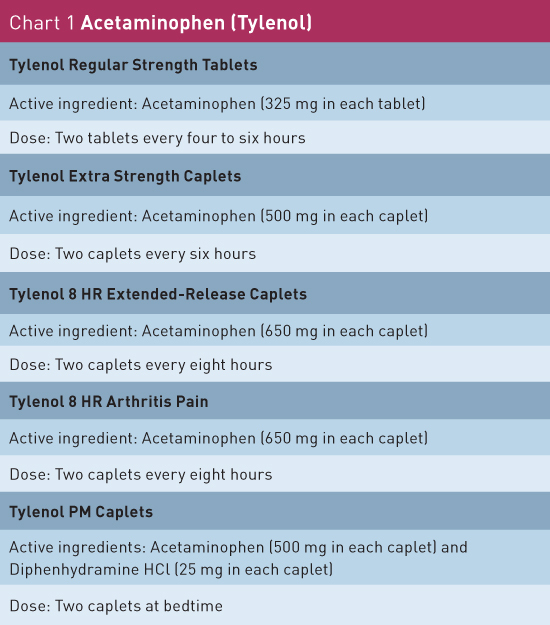 Additionally, new recommendations limit the amount of per day combination pills to 325 mg of acetaminophen.15-17 The brand name Tylenol is also available over the counter and comes with specific products for headache/muscle pain, arthritis pain, and sleep/pain (see Chart 1). The best form of treatment is to combine a safe pharmacological program with nonpharmacological medications for patients' maximum benefit to relieve pain. Nonpharmacological treatment programs are aimed at targeting the site and source of pain conditions. They involve exercise programs (eg, physical therapy, tai chi, and aqua therapy), transcutaneous electrical nerve stimulation (TENS) application, heat/ice therapy, assistive devices, psychological methods (eg, relaxation, biofeedback, hypnosis, cognitive behavioral therapy, social interventions), and targeted interventional options for pain conditions.2,4,20 In older individuals, nonpharmacologic options have benefits that include fewer risks of side effects and less expensive treatment. This offers two key advantages that benefit the patients and their insurance providers such as Medicare. The most effective exercise regimen is a program that combines a patient's condition and a physical therapist. A physical therapist is responsible for planning an exercise program that generally focuses on the basic components of flexibility, strength, and aerobic education. As the population ages, a majority will suffer from a plethora of musculoskeletal pain. Unfortunately, for the geriatric population, chronic musculoskeletal pain can lead to a vicious cycle of discomfort and disuse. However, with multimodal treatment regimens that incorporate OTC medications, topical agents, exercise programs, psychological support, and interventional therapies we can hopefully end the cycle of chronic pain and improve overall quality of life. — Rosemary Laird, MD, MHSA, AGSF, is a geriatrician, executive medical director of senior services for Florida Hospital at Winter Park, and past president of the Florida Geriatrics Society. She is a coauthor of Take Your Oxygen First: Protecting Your Health and Happiness While Caring for a Loved One With Memory Loss. 1. Podichetty VK, Mazanec DJ, Biscup RS. Chronic non-malignant musculoskeletal pain in older adults: clinical issues and opioid intervention. Postgrad Med J. 2003;79(937):627-623. 2. Edeer AO, Hulya T. Management of chronic musculoskeletal pain in the elderly: dilemmas and remedies. INTECH Open Access website. http://www.intechopen.com/books/pain-in-perspective/management-of-chronic-musculoskeletal-pain-in-the-elderly-dilemmas-and-remedies. Published October 24, 2012. 3. Cooner E, Amorosi S. The Study of Pain in Older Americans. New York, NY: Louis Harris and Associates; 1997. 4. Hochberg MC, Altman RD, April KT, et al. American College of Rheumatology 2012 recommendations for the use of nonpharmacologic and pharmacologic therapies in osteoarthritis of the hand, hip, and knee. Arthritis Care Res (Hoboken). 2012;64(4):465-474. 5. Murphy L, Schwartz TA, Helmick CG, et al. Lifetime risk of symptomatic knee osteoarthritis. Arthritis Rheum. 2008;59(9):1207-1213. 6. Barbour KE, Helmick CG, Theis KA, et al. Prevalence of doctor-diagnosed arthritis and arthritis-attributable activity limitation — United States, 2010–2012. MMWR Morb Mortal Wkly Rep. 2013;62(44):869-873. 7. Hootman JM, Helmick CG. Projections of US prevalence of arthritis and associated activity limitations. Arthritis Rheum. 2006;54(1):226-229. 8. Bressler HB, Keyes WJ, Rochon PA, Badley E. The prevalence of low back pain in the elderly. A systematic review of the literature. Spine (Phila Pa 1976). 1999;24(17):1813-1819. 9. Weiner DK, Kim YS, Bonino P, Wang T. Low back pain in older adults: are we utilizing healthcare resources wisely? Pain Med. 2006;7(2):143-150. 10. Weinstein JN, Lurie JD, Olson PR, Bronner KK, Fisher ES. United States' trends and regional variations in lumbar spine surgery: 1992-2003. Spine (Phila Pa 1976). 2006;31(23):2707-2714. 11. Gloth FM 3rd. Pain management in older adults: prevention and treatment. J Am Geriatr Soc. 2001;49(2):188-199. 12. Arnstein P, Herr K. Pain in the older person. In: Fishman SM, Ballantyne JC, Rathmell JP, eds. Bonica's Management of Pain. 4th ed. Philadelphia, PA: Lippincott Williams & Wilkins; 2010:782-790. 13. American Geriatrics Society Panel on the Pharmacological Management of Persistent Pain in Older Persons. Pharmacological management of persistent pain in older persons. J Am Geriatr Soc. 2009;57(8):1331-1346. 14. Udeshi AR. Pain management strategies. Today's Geriatric Medicine. 2014;7(6):14-17. 15. Buvanendran A, Lipman AG. 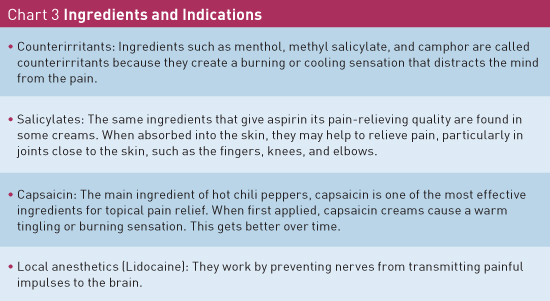 Nonsteroidal anti-inflammatory drugs and acetaminophen. In: Fishman SM, Ballantyne JC, Rathmell JP, eds. Bonica's Management of Pain. 4th ed. Philadelphia, PA: Lippincott Williams & Wilkins; 2010:1157-1171. 16. Shega JW, Morrissey MB, Reid MC. From publication to practice: an interdisciplinary look at the labeling changes for acetaminophen and the implications for patient care. Washington, DC: Gerontological Society of America; 2011. 381650.htm. Published January 14, 2014. Accessed January 31, 2016. 18. Singh G. Recent considerations in nonsteroidal anti-inflammatory drug gastropathy. Am J Med. 1998;105(1B):31S-38S. 20. Abdulla A, Adams N, Bone M, et al. Guidance on the management of pain in older people. Age Ageing. 2013;42(Suppl 1):i1-i57. 21. Ringdahl E, Pandit S. Treatment of knee osteoarthritis. Am Fam Physician. 2011;83(11):1287-1292. 22. American Geriatrics Society Panel on Exercise and Osteoarthritis. Exercise prescription for older adults with osteoarthritis pain: consensus practice recommendations. A supplement to the AGS Clinical Practice Guidelines on the management of chronic pain in older adults. J Am Geriatr Soc. 2001;49(6):808-823. 23. Fransen M, Nairn L, Winstanley J, Lam P, Edmonds J. Physical activity for osteoarthritis management: a randomized controlled clinical trial evaluating hydrotherapy or tai chi classes. Arthritis Rheum. 2007;57(3):407-414. 24. Ozyalçin NS. [Minimal invasive treatment modalities for geriatric pain management]. Agri. 2004;16(2):26-36. 25. Kloth D, Trescot A, Riegler F. Pain-Wise: A Patient's Guide to Pain Management. Hobart, NY: Hatherleigh Press; 2011.